Turn off technology: Cell phones, work, email, TV. Schedule it: Like you schedule the other appointments in your life, put dinner in your calendar. Instead of Skyping to dinner, go home to dinner and Skype back to work. Be flexible and easy on yourself: If you have a soccer game, bring a picnic. If schedules don’t match, stretch dinner out: Veggies and dip while cooking, dinner with one parent, and dessert with other parent after work. Keep other meals in mind: If dinner isn’t possible, have family breakfast or late night snack. Make it Simple: The last thing you want is more stress. Pre-make meals: Cook a big batch of soup or a double batch of a casserole over the weekend, and freeze it to make weekday dinners easier. Choose meals that are fast to assemble: Meals can be thrown together quickly with help from store-bought ingredients, like pre-cut veggies or pre-made pizza dough. Have everyone pitch in: Getting everyone involved makes dinner easier/faster, not to mention more of a fun event. Encourage kid participation with simple dishes – crepes, tacos, or even a pot of chicken rice soup, which kids can add their favorite toppings to, like chopped carrots or peppers, roasted garlic or sliced cheese. Dishes with bright colors also encourage participation. 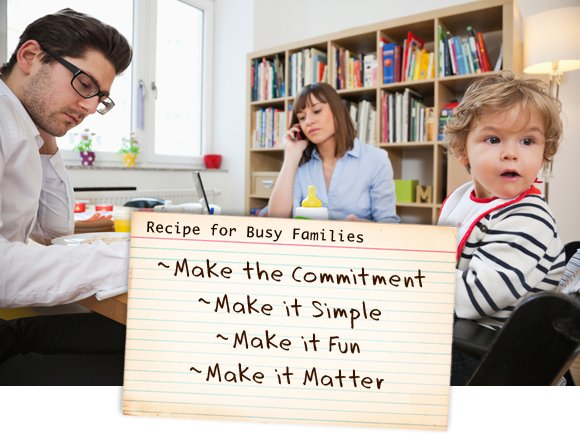 Make it Fun: The more fun/special parents make meals, the more likely that kids will clamor to keep having them. Create meals based on favorite books, like Green Eggs and Ham or quidditch stew from Harry Potter. Let your teens pick the music. Let kids choose the ingredients for Family Iron Chef. Engage kids in great conversation, which is always fun. Play games at the table, like tell two truths and a tall tale, and have everyone else at the table guess which is which. Play with your food: Have kids arrange salad into a face on a plate, or make shapes out of pizza dough. Make it Matter: The table is one of the only places left where families consistently have conversations together. Tell stories about earlier times in your lives. Ask open-ended questions so kids can talk. Tell stories about grandparents and other relatives – about romance, work and overcoming adversity. Make plans and dream together.